The concluded Northern Province elections was ample testimony that democracy is vibrant in the country. A party which has a policy different to that of the government captured power in the Northern Provincial Council. The inflow of Foreign Direct Investments (FDI) has showed the political stability of the country. When there is political stability, there will be increased foreign investments. 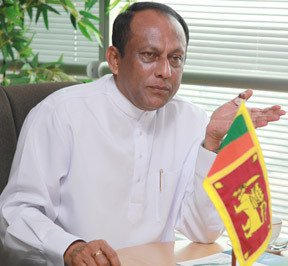 Restoration of peace in the country and the inflow of direct and indirect investments prove political stability prevails in the country, Investment Promotion Minister Lakshman Yapa Abeywardana said in an interview with the Sunday Observer. A new Ministry entrusting the task of “Investment Promotion” was established under the Gazette Notification No 1796/10 dated February 6, 2013, as amended by Gazette Notification No 1798/13 dated February 18, 2013. Minister Abeywardana was appointed as the subject Minister and Faizer Mustapha was appointed as his deputy. In the several elections including Presidential, Provincial and local Government elections UPFA led by President Mahinda Rajapaksa recorded a landslide victory and it depicts the masses have rallied round the President and the Government. The UPFA led by President Mahinda Rajapaksa will capture the power of Western and Southern Provincial Councils. There is a stable political situation in the country that has led to the inflow of foreign investments towards the country. Several new foreign direct investments from European countries are to come to Sri Lanka. This depicts their trust in the political stability in the country. The economy of certain countries have totally collapsed because there is no political stability due to internal conflict. Sri Lanka has turned into a fast growing country in the region. Minister Lakshman Yapa Abeywardana is a representative of Matara District and was formerly Minister of Media, Deputy Minister of Economic Development, and Minister of Foreign Employment Welfare. He was born to a prominent political family in Matara in the Southern Province, where his father held local and provincial leadership positions. He was educated at Mahinda College, Galle. Abeywardana has been a proponent of various micro-level development programs to enable the people to improve their quality of life. He is the Chairman of the Lakshman Yapa Abeywardana Foundation. Abeywardana resides in Colombo. He is married and has three sons. Q: Are you confident that Western and Southern provinces can be captured by the UPFA? A: Of course, all communities without race, cast religious and colour differences have rallied round President Mahinda Rajapaksa and the Government. President's prediction will never go wrong. UPFA will capture both provinces with a thumping majority. President Mahinda Rajapaksa is a leader who knows the heartbeat of the people who live below the poverty line. He has implemented a large number of infrastructure and livelihood development programs covering, Gampaha, Colombo, Kalutara, Galle, Matara and Hambantota districts. The infrastructure development projects implemented by the Government is enough to ascertain the victory of UPFA. In addition these provinces have achieved tremendous development within the concluded couple of years under the guidelines an instructions from President Mahinda Rajapaksa from time to time. The people have realised what happened to the country in the past. The innocent civilians were mercilessly assassinated by the LTTE. All who know the past will take their decision loyal to the Government that eliminated the terrorism. Q: Can you explain the connection between the political stability and economic growth? A: Economic growth is possible only when there is political stability in a country. There is a close link between political stability and economic growth. When there is political stability and well-developed infrastructure facilities there will be an inflow of foreign investments. Restoration peace and development of infrastructure facilities have made Sri Lanka into a favourable destination for foreign investments. Sri Lanka has been on the investment radar after the Commonwealth Business Forum of the CHOGM and we have now witnessed increased appetite for investments by foreign investors around the world as global investment giants and Corporates have turned their lenses to Sri Lanka. One very significant point is that in recent months my Ministry and the BOI developed a catalogue of structured projects. This has made it much easier to attract investments since the international investors seek structured projects where they can place their money. Sri Lanka needs investments that will safeguard our environment, adheres to laws of the land and also helps in sustainable economic development. At the Investment Promotion Ministry, we are willing and ready to engage with any serious investors who wish to take advantage of various investment opportunities and prospects in our country. Q: What is your opinion of the entrance of younger generation to politics? A: I welcome the emergence of a younger generation of politicians since they can really feel the pulse of the youth, the future of the Nation. We have in fact already seen this new generation enter Parliament, the Provincial Councils, Pradeshiya Sabhas and other local government bodies. The President understands well the potential of the youth in the development of the country. I too have a young Deputy Minister of Investment Promotion, Faizer Mustapha, to assist me in this important task. President Mahinda Rajapaksa’s vision is based on the notion that the Future Sri Lanka’s foundations are being built by today’s youth. This is a winning strategy. Q: Can you explain the success behind CHOGM? A. There are many lessons to be drawn from CHOGM. The first is that the whole country drew enormous pride in the fact that Sri Lanka hosted this International forum and every quarter in the country worked tirelessly to make it a success. In addition, world leaders, their delegations and the thousands of businessmen accompanying them saw first hand that a “New Sri Lanka” had emerged since the end of the war against terrorism. They were able to appreciate the fact that this country has gone a long way and offers excellent opportunities as a destination for business, tourism and investment. Sri Lanka will definitely stand to gain from CHOGM in the long term.